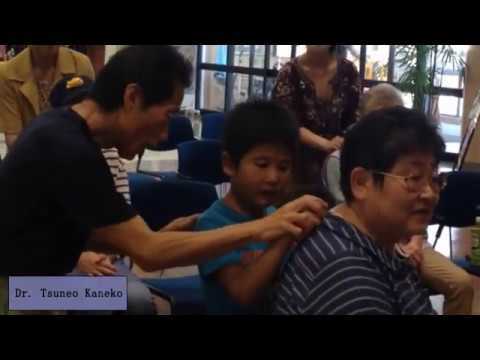 In visiting Rikuzentakata and Ofunato in September this year, my goal was to share Music Hands with some of the communities in Japan that were affected by the 2011 Tohoko earthquake and Tsunami. I wanted to bring the message of compassion and hope of Music Hands to families and seniors that have gone through great difficulties and sadness. In bringing Music Hands I wanted to help families strengthen their family bonds to better cope with their difficulties. -Promotes parent’s relaxation through relieving tense muscles. My first stop teaching Music Hands was at the Abassetakata Center where the highlight of the visit was teaching kids how to practice music hands on their grandparents. Mrs. Fukuda’s two grandchildren practicing “pray the back” with Dr. Kaneko’s instruction. They thoroughly enjoyed learning music hands to the fun rhythm of the Music Hands song. It was a magical and lovely opportunity for them to bond with their grandparents and to foster kindness. At the same time, the grandparents enjoyed the experience and appreciated the attention they were receiving. When kids practice Music Hands, they become aware of the value of their actions and healing abilities and it gives them a sense of accomplishment. Music Hands can also deepen the bonds between children and parents while bringing some stress relief to parents. These kids also loved monkey business. I believe this type of play activity was particularly important because it reminded kids of laughter and play, something that may be harder to come by after a tragedy. Everyone needs laughter, especially in tough times. Shouta and his little brother definitely deserved the chocolate bar award after they treated their grandmother to Music Hands! Mrs. Fukado’s grandson, Shouta, practicing “drum the neck”. Ofunato is a beautiful beach and fisherman’s town. After riding very small local trains running through the lovely trees and the mountains I discovered a fairyland. The view towards the ocean is gorgeous. It reminds me of someplace in Big Sur. It was unbelievable that this gulf was one of the biggest hit areas when the tsunami attacked 6 years ago. It is totally peaceful now but we should not forget to pray for the victims and the remaining families. There will always be sunny days after the storm. People I met in the town are very positive and sharing hope for tomorrow. It seemed that my messages for a good life, full of joy and laughter as we age, were well received at the community center. An added benefit, shoulder tapping recipients were able to raise their arms with more ease. Everyone had a good time! With Eri Suzuki (L) and Takako Niinuma (R). My special thanks to Eri Suzuki of Tohkai Shimpo, Takako Niinuma of Dreamnet Ofunato, NPO, Mutsuko Hirayama, Masao Kanazawa of the community volunteer group and Ms. Sugano and Mr. Takagi of the Abassetakata Center in Rikuzentakata.